Which skeleton watch offers the best combination of price, fashion design, quality in terms of reliability and accuracy? Sea-Gull M182SK is the answer. Don’t buy twenty dollars junk skeleton watches made of underground factories that are likely broken in a couple of weeks and run poorly with over 30 seconds discrepancy per day. Watches are durable items. Do not sacrifice quality just want to save one hundred dollars. Priced as an introductory watch, this M182SK offers exceptional value. It is so well-made that its craftsmanship rivals the best skeletons made in the world. Seeing is believing. The real merchandise is more impressive than photos. The Armitron series might be designed in the similar way, but the overall quality is not equivalent to this seriously-made M182SK. FYI, there is cheaper M182SK sold somewhere online costing $20 less. Please be alert. Do not sacrifice quality for the sake of saving only $20. You are likely to receive a sub-standard product and no one cares about your ownership experience. Available in blue, black, red and pink M182SK, please choose at pull-down order menu. Either black or brown leather band can be installed. Specify your preference once having placed an order. Otherwise color will be chosen at random. A skeleton watch’s plate is deliberately made hollow without any covers in order to have the most space to demonstrate gears and parts. The hollow design reduces the overall strength and supportive capability of the plate. It places higher demand to control the self-winding rotor as it exerts force when swinging back and forth. Fully-wound main spring also adds pressure to the plate. A fine skeleton watch is not only a precise mechanical device, but also a piece of timeless art work. The gears are moving constantly; all parts are cooperating perfectly, as if they have spirit and livelihood. Even if you are not a technician, it is a pleasure to see the intricate mechanical motion at every moment. Other things being equal, skeleton watches are relatively more expensive, especially for those with carved designer patterns by master watch makers. High-end skeleton watches made of precious metal case can easily reach over 10-40 thousand dollars, most of which are hand-winding and simple basic function. 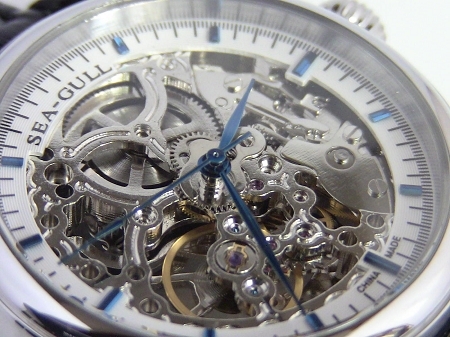 A well-made skeleton watch is an artistic expression, an aesthetical experience. Pretty much everything exceeded my expectations. I ordered on a Thursday evening in the US and received the watch the next Thursday. The watch itself is beautiful. Its a bit smaller than I am use to, but I love it. This is the nicest watch I have purchased, and the price cannot be beat. Lovely watch- especially for the money. Quality product and looks great. The only constructive criticism I'd give is a little better communication to re-assure the customer. Overall, prompt delivery and trustworthy service- happy customer. This is the second time I'm buying this watch from this seller. The first watch I bought lasted 2 years before I accidentally cracked the crystal by hitting my hand against a rock. The crystal is repairable, but unfortunately the local repair shop damaged the workings of my first watch during the process. I tried several other brands of full skeleton watches like this and they all broke within a couple months so I was nervous about this one, especially buying an "off brand" overseas. I'm happy to say this one never had any problems until I let the local watch shop try to fix the cracked crystal. Before the cracked crystal, I actually had bumped the watch around quite a bit. I was always surprised I didn't damage it with the amount of rough activity I put it through. The watch looks more delicate than it is. The price from this seller is about 1/2 off other websites who sell it in the US. I constantly get comments on how "cool" this watch is and I've never seen anyone else who has one like it!